Name of breed: Standardbred, or American Standardbred. Breed origin: The world’s fastest harness racing horse, the Standardbred was developed in America in the late 18th and early 19th centuries after a Thoroughbred stallion called Messenger was imported from England. Messenger was a ‘flat racer’, not a trotter, but he sired many successful harness racers who were bred to horses with Cleveland Bay, Thoroughbred, Arab, Barb, Norfolk Trotter, Hackney, Morgan and specialised American pacing bloodlines. Messenger’s great grandson, Hambletonian 10, is considered the foundation sire, and all existing Standardbreds can be traced back to him. Born in 1849, Hambletonian 10 was a big and powerful horse, with huge hindquarters, a deep, thick chest and a croup 2 inches higher than his withers! This ‘downhill’ conformation made him an exceptional pacer and proved a strong gene, resulting in great harness racing success for both him and much of his 1,335 offspring. The Standardbred breed registry was established in 1879, with all breeding stock required to pace a mile in less than 2 and a half minutes. This racing ‘standard’ is how the breed got its name. Distinguishing features: The Standardbred has been bred primarily for performance traits rather than aesthetic traits, so a lot of variation can be seen in its appearance. However, universal traits include a deep chest, well-sprung ribs, a short topline with withers extending back beyond the long, sloping shoulders, and a high croup. Standardbreds’ legs are muscular with good bone, leading to large, tough hooves, and their overall appearance is lean and athletic. They are usually black, bay or brown, but can also be chestnut, roan or grey. They have calm, steady temperaments and are very people-oriented, making them easy to train and work with. 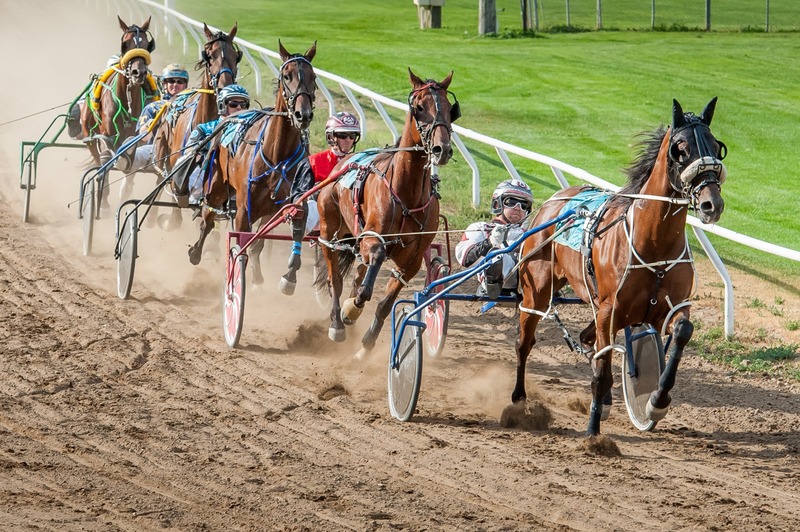 Modern day Standardbred: Standardbreds are still primarily used for harness racing, a sport popular in many places including the US, Australia, New Zealand, the UK and Europe. The current world record for harness racing over a mile is held by Always B Miki, a stallion who raced the mile in 1 minute and 46 seconds. Off the track, Standardbreds are gradually gaining popularity. They have been competed very successfully in show jumping, eventing, cross country, endurance riding and even dressage, and make excellent driving horses, pleasure mounts and therapy animals. References: Oklahoma State University, Wikipedia, Standardbred Association Queensland, Equiworld, Cowboy Frank. Image credits: Harris Paint Horses, HRV HERO, The Trots, Richard McGuire.